Well, it was a lovely surprise coming home to this box. It is definitely larger than previous boxes I have had (almost twice the size of a Loot Crate box) so I was eager to see what was in it. Definitely worth the wait. On opening the box I found it to be neatly packed with orange tissue paper over the contents. The items in the box were in a word – awesome! Definitely a good selection for geeks, young and old. 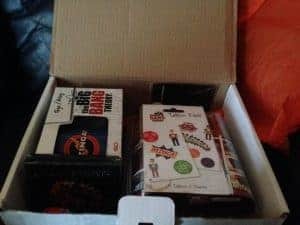 I loved the Big Bang Theory items as I’m a huge fan (who isn’t?)! The Bazinga mug is a striking blue and seems well made. Only downside to it is you can’t put it in the dishwasher. A fab mug though! The tattoos are a great novelty gift too to keep fans of any age amused. My daughters and I will have fun with these. 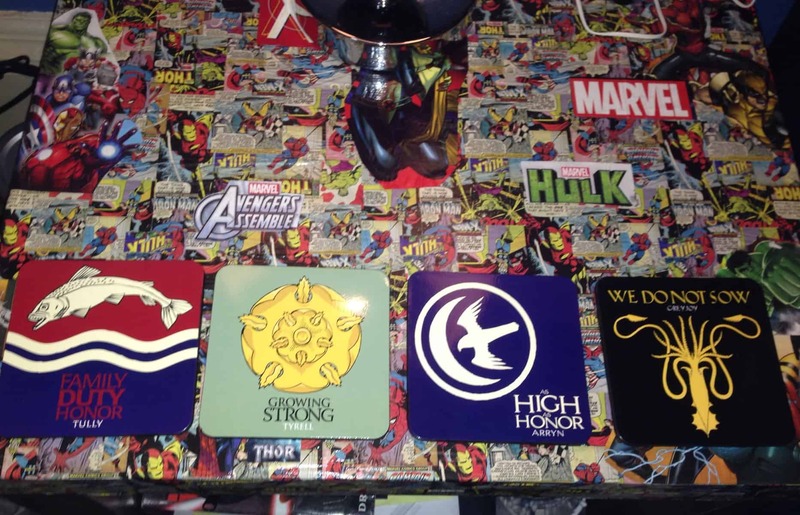 Second fave item is definitely the Game of Thrones coasters. They look great in the living room! They’re cork based with the house crests on. Perfect for any fans out there! The popping candy is an old favourite of mine, which I don’t see in shops often. I can honestly say I’ve never found Tranformers popping candy before. The bag contained a few small packets of popping candy in different flavours. They all tasted great and reminded me of Pop Rocks, the kids loved them too :) The Kinder egg didn’t last long either. We found a Wolverine in our one and as you can tell by the pic, the chocolate didn’t last. Last but definitely not least, Heroflix Superheroes starter pack – I hadn’t heard of these at all before now to be honest. They are from a company called TabApp. The pack contains little figures (Ironman, Captain America and Thor) with bases which can be twisted. The figures are used with an ipad app and you place the figures on your ipad while the game is running to activate your heroes. I tried using these with the ipad, but found them fiddly and unless you like changing your character a lot, you seldom use them. They do look good as ornaments when not in use I have to say. These are a great item for teenagers or younger kids but unless you have an iPad, or access to one you can’t really use them for their gameplay. 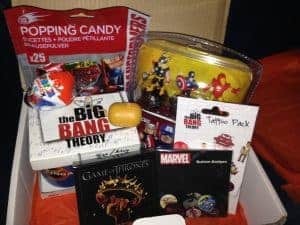 Monthly mystery boxes bursting with PREMIUM geek goodies from the world of movies, videogames and TV. 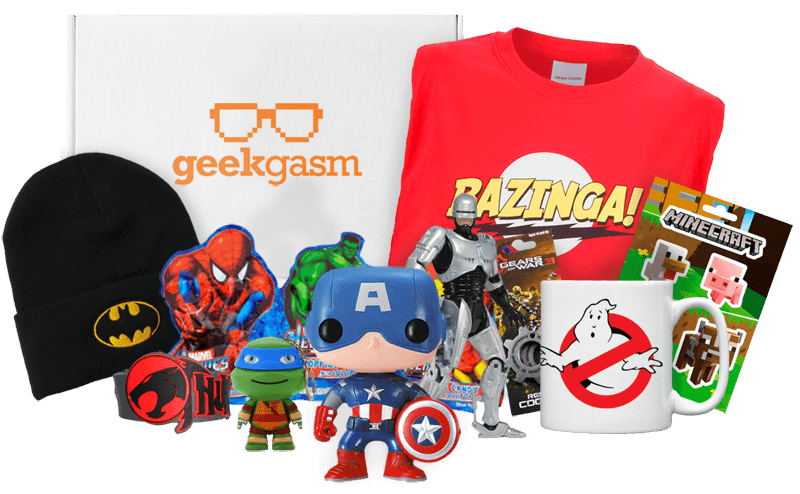 All delivered to your doorstep in one amazing geekgasm package. 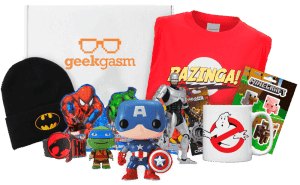 At geekgasm we have a team of dedicated geeks working constantly to bring you some of the best and coolest items they can find. Our team has over 20 years experience working within the toys, movies & videogames industries and you can safely relax knowing your goodies are in safe hands……seriously we reek GEEK!! Our aim is to give you a major geekgasm and hopefully you’ll continue to want multiple geekgasm’s over the coming months. Hey, why not even send one as a gift to a family member or friend, as our boxes are filled with super cool PREMIUM content every month and would make an awesome pressie!! Bronze – contains at least five goodies, £18.99 + £2.99 p&p. Silver – this one contains at least six items, £22.99 + £2.99 p&p. Gold – contains at least eight geeky goods, £34.99 + £2.99 p&p. How would you rate geekgasm ?